Stained Glass Windows for The Emmaus Chapel, Church of the Good Shepherd, Pyrford, Surrey – a series of contemporary stained glass windows inspired by Luke, Chapter 24. 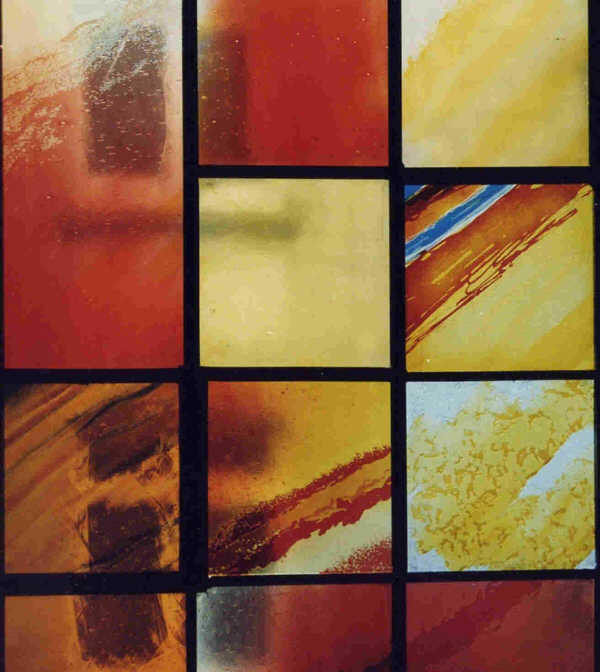 These 8 stained glass windows were commissioned at the end of 1999. A new chapel was built onto the Church of the Good Shepherd, Pyrford in Surrey and I was given the above passage from the bible as inspiration for the design. The chapel is called the Emmaus Chapel. These stained glass panels are 1 metre high by ½ metre wide and there are 8. It was a very long process, acid etching with hydrofluoric acid and silver staining the pieces. When the sun shines through the stained glass it throws a superb warm glow onto the altar. I used a sunset theme to imply the line in the text ‘for evening draws on’. The overall upward strokes give the whole design a positive and uplifting feeling and this is a device I often use in my work. As in the beginning of Luke 24, the first part of the window is pale and quiet, symbolising Verse 15 where His disciples had not yet realised that Jesus of Nazareth walked with them. The strong bright colours not only suggest sunset, but evoke the verse in which their ‘eyes were opened and they recognised Him’. The design leads us to the Lord’s Table reminding us that ‘he broke bread and offered it to them’. In the stained glass panels I have used a combination of acid etching, silver staining and enamelling to achieve the subtle colour changes within each piece of leaded glass. The panels are leaded together using leads of differing widths to add depth and structure to the windows. 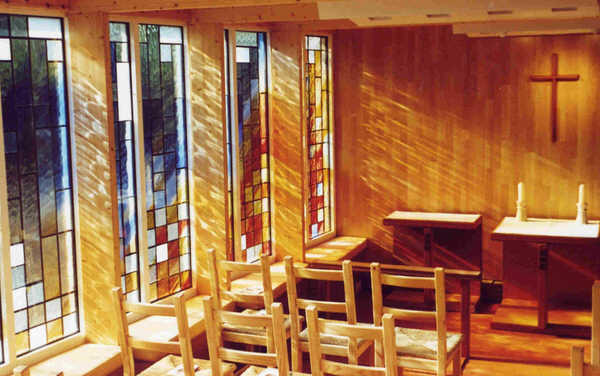 These stained glass panels are encapsulated into sealed units with a patterned obscured glass to the outer pane affording extra security and privacy to the chapel.